Finally, a little white for the valley in early December. It is amazing the difference we are seeing between the upper elevations and the valley floor this early winter season. 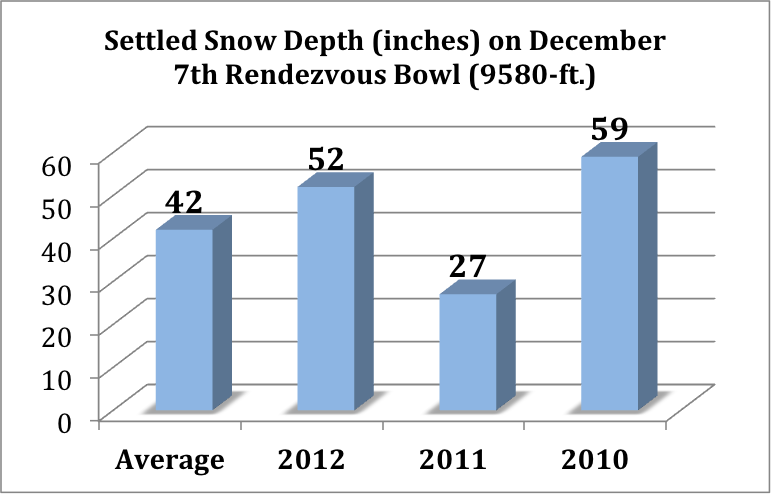 At the Jackson Hole Mountain Resort at the bottom of Rendezvous Bowl (around 9500-ft.) there was 52 inches of settled snow depth on December 7th. Last year on this date there was only 27 inches of settled snow. The average snow depth for the date here is 42 inches. Just a trace of snow in the Town of Jackson this morning. But what is truly amazing is that two winters ago in December of 2010, the start of that huge Winter of 2010-11 we had 59 inches, so we are only 7 inches behind that early December depth. (See chart below). As a matter of fact, this is the second deepest snowpack we’ve had at this location in the last 15 years! 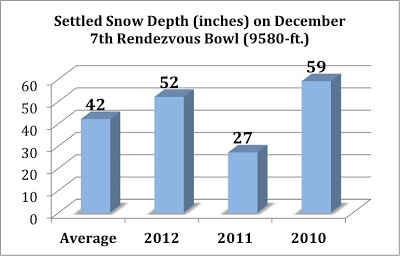 Early December 1996 was the last time Rendezvous Bowl had more than 59 inches, with a 72-inch base up there to start the season. Now we just need to send some of that to the bottom of the Hill. The Teton Mountains have done well these last two weeks, and temperatures are cooling down this weekend, getting downright cold, with some nice, light dry powder to top off this base in the mountains, and paint the valley with its first good coat of white, that will likely stay put this time around.